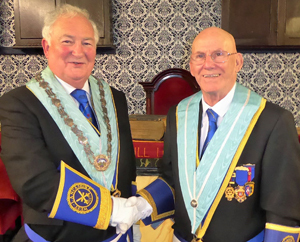 The brethren of Harthill Lodge No 8443 were delighted to welcome Assistant Provincial Grand Master Derek John Parkinson as their principal guest for the installation of David (Dave) Painter into the chair of King Solomon. The meeting which took place at Garston Masonic Hall, saw Dave assume the chair for the second time within Harthill. Derek Parkinson (left) congratulates Dave Painter. Amongst those accompanying Derek on this important evening for the lodge were Garston Group Chairman John Murphy, grand officer and honorary lodge member Howard Griffiths and acting Provincial Junior Grand Deacon Malcom Hodgson. The evening commenced on a very bright and positive note with the admission of a new joining member William (Bill) Todhunter to the lodge. The WM Jim Gwyther completed the remaining routine business before lodge director of ceremonies Ken Jones requested permission to retire from the lodge. Ken returned to announce that the APrGM stood without and demanded admission. Receiving Derek and the other distinguished brethren, Jim formally welcomed Derek on behalf of the lodge and was pleased to offer him the gavel, which Derek accepted and returned with equal pleasure. In a ceremony worthy of the occasion and no doubt ensuring a lasting memory for the new WM, Jim installed his successor in the same manner as he has conducted the business of the lodge in the past two years as WM, with pride and dignity. Jim also undertook the presentation of the working tools in all three degrees. Dave then appointed and invested the officers for the ensuing year, which included a first office within Harthill for new member Bill. Les Brooks delivered the address to the deacons, Mark Richardson the address to the inner guard and Ken Bullen the address to the new master. The final address to the brethren of Harthill Lodge was delivered by Derek, so concluding the ceremony of installation. Dave Painter (left) and installing master Jim Gwyther. Derek was again on his feet, this time to offer Dave the congratulations and best wishes of the Provincial Grand Master Tony Harrison, whom, Derek said had expressed his best wishes, not just to Dave, but to all the brethren and his hope that they continue to enjoy their Freemasonry. Derek continued by saying that, had he been present Tony would no doubt have extended his congratulations to the DC Ken, for his role in ensuring a smooth and enjoyable evening. It was then Dave’s opportunity to present Derek with a cheque for the sum of £500 in support of our MCF 2021 Festival. A cheque Derek was pleased to accept and offered his congratulations to the brethren for such a magnificent sum from such a small lodge. With the distinguished brethren having retired from the lodge, the remaining business of the evening was conducted before assembling in the hall lounge to toast the new WM and adjourning to the dining room for a well deserved dinner. During the festive board Derek updated the brethren on the various activities within the Province, including two recent donations of considerable sums to Zoe’s House and St. Vincent’s School, here in the city. He also took the opportunity to add his own personal congratulations to the new WM and those brethren that had contributed to the evening’s proceedings. A ‘Chorley’ raffle was then held for an item of football memorabilia and the magnificent sum of £140 was raised to further aid our charitable works. To conclude the evening Dave presented gifts of flowers to both Derek and John Murphy for their respective wives, Joan and Jan.
Pictured from left to right are; Malcom Hodgson, Derek Parkinson, Dave Painter, Jim Gwyther, John Murphy and Howard Griffiths.